I made these cards to say thank you to 2 brilliant women. who have been very kind to me. The top one is for Sarah to say thank you for the gorgeous Secret Sister goodies she sent me and the bottom one to Jules to say thank you for the Blog Candy I won from her and ordering some goodies from Stampin' Up! for me. I have used a gorgeous stamp by Christine Dark for Spiral Whisper and teamed it up with Stampin' Up Designer Series papers and CS, Craftwork Cards message, ribbon and Dew Drops added to finish. STAMPS: Spiral Whisper. INK: Stazon Jet Black. CS: Craftwork cards, Stampin' Up! patterned paper by Stampin' Up! ACCESSORIES: Ribbon by Ribbon Oasis, Craftwork Cards Mini Message, Dew Drops. Beautiful cards Michelle and I just love the papers that you have used. Thank you so much for my lovely card! It's sitting proudly on my mantlepiece! love the stamp ,great colours so deicate. Hi Michelle! I just wanna say that your designs are gorgeous and elegants. You are an inspiration. Beautiful cards Michelle! Very elegant and classy. As I love your blog there is something over on my blog for you to retrieve.Go quick!!!! These are both lovely, Michelle! The stamp is gorgeous and I love the little gems- I've not seen them before, they're stunning! I love both of these cards - they are very beautiful indeed. 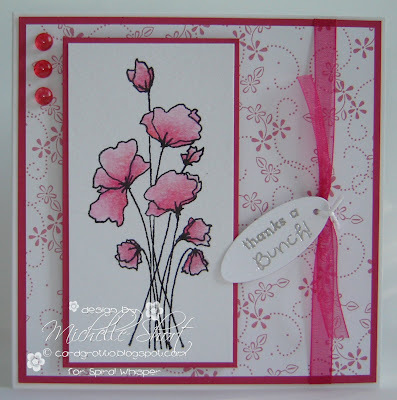 Two absolutely beautiful cards Michelle.Gorgeous images and beautifully coloured.Gorgeous PP. simply beautiful, that stamp is a must hace in ya stash..